This article intends to give crypto skeptics, new crypto investors, as well as crypto veterans a lightweight introduction to one of the most undervalued game-changer crypto projects in 2018. If you are considering investing in cryptocurrencies or are on a hunt for an incredibly useful and innovative project, the valuation of which has not yet skyrocketed, this article is definitely for you. You can also find this write-up helpful if you prefer to invest in the company of the next potential Ebay (and likely something bigger) in the form of stocks rather than an open-source cryptocurrency. Most people I talk to are either still skeptical about blockchain technology or only know about Bitcoin, Ethereum and Ripple at most. It is widely believed that Bitcoin’s blockchain was hacked when its price fell more than 80% over the years 2014 and 2015. The reality is: it’s never been hacked. It has always been the centralized exchange platforms that could be hacked so far, in the same way it happens to many other conventional websites on a daily basis. Behind blockchain technology, a highly sophisticated and very powerful mathematical concept hides that is supported by a redundant and decentralized architecture, proving and strengthening itself day after day it survives. I also hear the following almost every day: “All coins are useless and are only copying Bitcoin”. While the lack of usability is arguable even in the case of Bitcoin, there is certainly an enormous number of scams out there right now. Nevertheless, one specific cryptocurrency already brings real value to the table and is likely to be a game changer as you will see shortly. While Bitcoin has always been the ‘mother of all coins’ and its valuation still serves as a benchmark for the whole crypto ecosystem, its technology has actually become somewhat obsolete by 2018 due to the fact that it can primarily operate as store of value — as stated by several well-known investors such as Peter Thiel in 2017. On the other hand, there are other innovative crypto projects that have overcome some of Bitcoin’s limitations yet and intend to solve real-world problems. As an example of such cryptocurrency, Ripple tries to speed up international transfers among banks by providing high-speed transfer solutions (~3 seconds as stated by Ripple, although system capacity is fairly limited as of today) through its not-quite-exactly-decentralized concept. Ethereum, the second largest truly-decentralized cryptocurrency after Bitcoin, was the first one offering smart contracts (allowing the performance of credible transactions without third parties). Unfortunately, Ethereum also has its limitations in terms of scalability and transaction speed similar to Bitcoin. Most of the other projects are yet to prove their concepts and make promises rather for the long run. If you think all well-established and innovative cryptocurrency projects have already been identified and skyrocketed by now, maybe I can surprise you. Syscoin is an awakening giant I’ve been following for a while. Its parent company, Blockchain Foundry, just raised 3.3 million dollars through traditional venture capital funding (instead of an unregulated ICO) in December 2017 and is preparing to go public on the Toronto stock exchange in 2018. In contrast to many other crypto projects, Blockchain Foundry already has a functional public-beta product built on its blockchain. Its team is working full-time and consists of some of the brightest, yet humble developers in the crypto world (for some recent breakthrough achievements, see R&D section). Blockchain Foundry has already created the world’s first truly decentralized marketplace, named Blockmarket, which eliminates the need for an intermediary, i.e., ‘middleman’, for most cases of buying/selling products and services. By doing so, Blockmarket cuts additional costs otherwise paid by yourself whenever you purchase an item on Amazon, Ebay, or Alibaba. 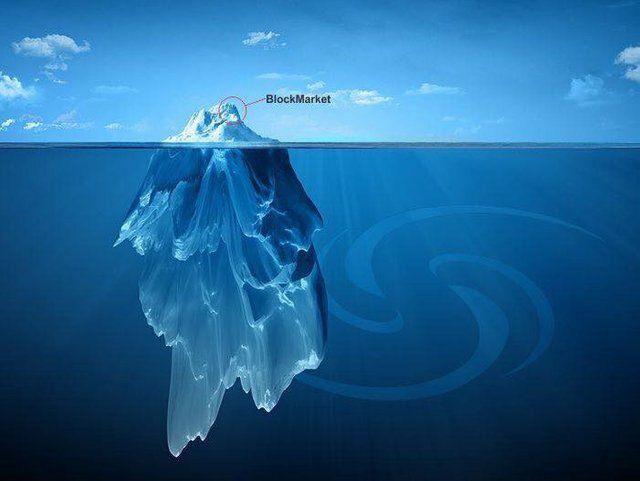 If you wonder in what stage this specific Syscoin product is right now, Blockmarket has several merchants with 100,000+ SKUs (Stock Keeping Units) ready to load upon Blockmarket release, while the interest is growing day after day. At present, Blockmarket is available in the form of downloadable beta software for PC and Mac. The website version of its public beta is just about to be released in February. From January 16th, you can also use 20+ other cryptocurrencies on Blockmarket and exchange them directly for SYS without the need to visit and register on any crypto exchange websites. 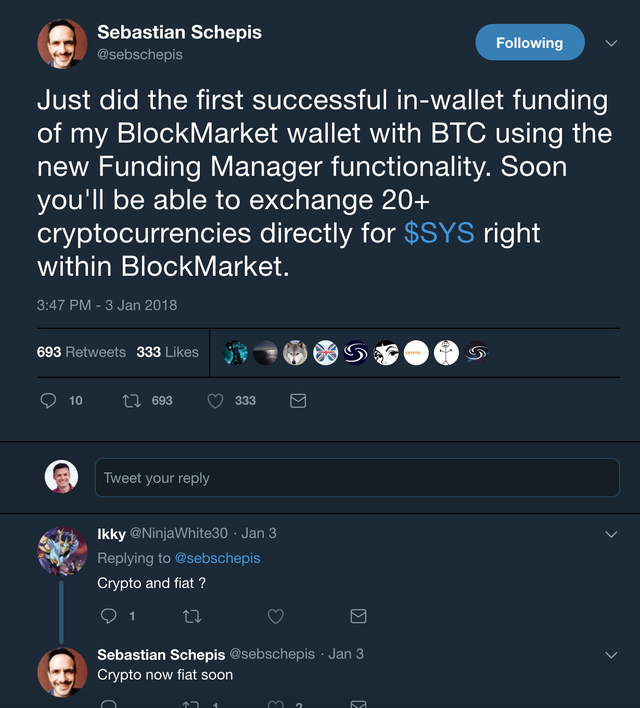 Fiat currencies will also be added on the platform soon, according to a tweet reply by Syscoin creator, Sebastian Schepis. In case you have reservations about the platform’s legality and the team’s general approach to law at this point, let me just tell you this: Syscoin and Blockmarket already support AML (Anti Money Laundering) and KYC (Know Your Customer) compliance with Syscoin Identities. Also, if you wonder how safe Syscoin really is and to what extent it has been tested so far: Syscoin successfully passed all aspects of a security audit performed by Digital Boundary Group last year. Blockchain Foundry also offers blockchain solutions customized for existent and future business partners and is in partnership with Microsoft. This means that the evolution of the Syscoin platform is primarily driven by real-world demand rather than just visions set beforehand. Even today, Syscoin is to be considered an innovative, multi-purpose, and truly decentralized blockchain solution being much more than a marketplace. Syscoin offers an incredibly high throughput capability of around 300,000 Transactions per Second (TPS). This level of TPS enables an enormously high number of applications and services to run simultaneously on top of the SYS platform. 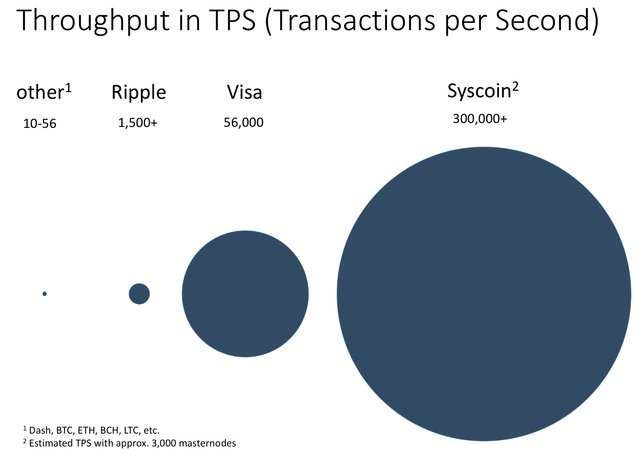 For comparison, Ripple is capable of only ~1500+ TPS, while Visa’s absolute peak capacity is at around 56,000 TPS (although Visa is set to run at no more than one third of that value at all times). 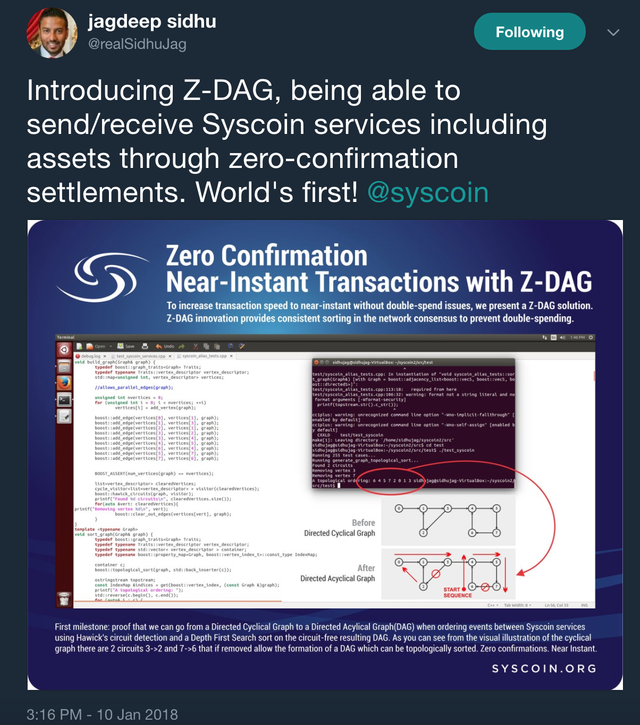 Besides the incredibly high throughput capability, Syscoin offers an additional layer for ICO/token issuance and Instant Asset Transfer, where instant means, well, almost instant. A token can be colored (signed) with additional, unique data, such as avatar, special powers, etc., to represent a character in a virtual world. Tokens would be fully tradable. You could also trade your Alias that has multiple characters. Diamonds and jewelries: Each token can be signed with additional data to allow witnesses or notaries to verify each stage of the process that the diamond would go through; for example, mining, cutting, recutting, mounting, etc. Limited-edition products: hand-made music instruments, antiques, vehicles, etc. Each token represents one item and can include additional custom data such as serial number, color, and other features. All of these assets could be traded on Blockmarket, or a customized marketplace built on the Syscoin blockchain. If you are familiar with Ethereum, assets work similar to ERC20 tokens, except that they are way faster. As you may know, there have been games built on Ethereum, such as CryptoKitties, which do not function flawlessly due to Ethereum’s speed limitations. Syscoin easily overcomes this kind of challenges. An additional layer of computing power enabling new SYS features is to be released in the form of masternodes towards the end of Q1 2018 (already functional on testnet). The team is currently rebranding and updating their websites, which are expected to be published in March. They also plan to start an aggressive marketing campaign once Blockmarket Web is ready for the mainstream public. 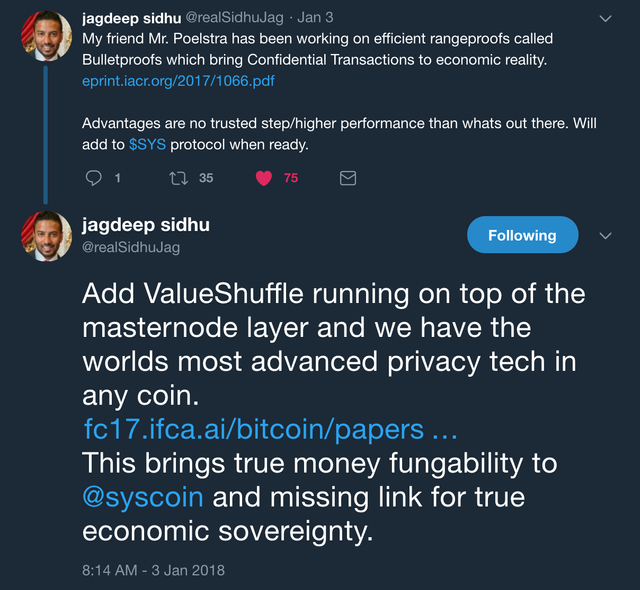 As compared to many other crypto projects, Syscoin with its $400 million market cap is incredibly undervalued as of January 12. Due to a long list of recent and upcoming events, such as the recent fund of 3.3 million dollars, Blockchain Foundry’s 2018 IPO, industry-shaking new innovations, breakthrough in transfer speeds, masternodes for additional computing power and features such as ICO capability and token issuance, rebranding and marketing campaign; it is just a matter of months that this project gets incredible attention and catches up with most of the highly valued ones in the crypto space. Once this happens, a $10 billion market cap (25x projected price appreciation) will be just the beginning in the mid-term. Disclaimer: This is not an investment advice, I am not a licensed advisor. This is my opinion only, I do hold SYS. TPS figure was created by myself and is not an official presentation by Syscoin or Blockchain Foundry. TPS values are estimates communicated by Syscoin. Very interesting. I didn't know Sys recently had venture capital funding. That's great! Thanks for sharing this info.